'The Act Of Killing' begins in a surreal, ethereal fashion that belies the horror at its core. Joshua Oppenheimer's documentary addresses the anti-communist purge in 1960s Indonesia that saw upto one million dissidents murdered. A more conventional piece would view the story from its victim's eyes, 'The Act Of Killing' fascinatingly delves into the insight of the unrepentant killers, forty years on. Oppenheimer focusses on a selection of the perpetrators, most notably Anwar Congo, Adi Zulkadry, and Herman Koto. Each committed numerous murders, with Anwar responsible for the death of a thousand. They seem rather blasé about the situation, undoubtedly a result of their lack of accountability, which extends to the government in power in Indonesia today. Indeed, many government ministers are proudly part of a paramilitary organisation that Anwar helped found, which happily engages in extortion and corruption. The perpetrators are invited by Oppenheimer to re-enact their killings on film, choosing to do so in the style of their favourite films and imagining themselves as the likes of Al Pacino, John Wayne, and Sidney Poitier. The resulting scenes range from the chilling to the ridiculous, mixing dramatic reconstruction with dreamlike sequences - such as the one seen in the film's opening. 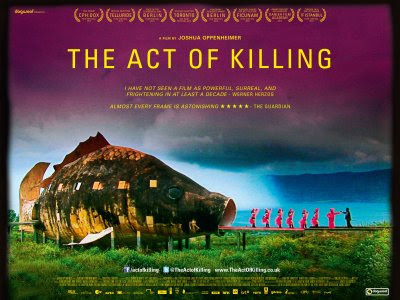 'The Act Of Killing' is on limited release in UK cinemas now, through Dogwoof.